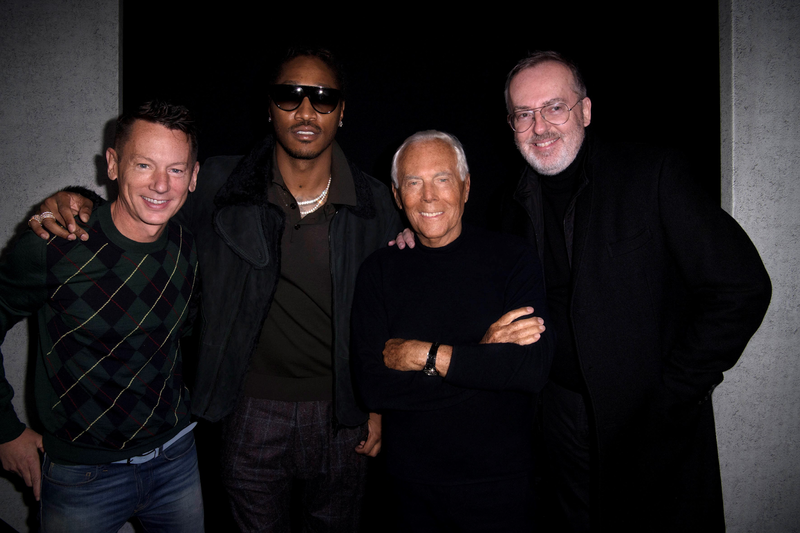 Today, Billboard chart-topping recording artist and fashion staple, Future, attended the Giorgio Armani August/Winter 2017- 2018 Runway Show during Milan Fashion Week as an exclusive guest of Mr. Armani himself. The fashion influencing rap-star sat front row draped head-to-toe in Giorgio Armani - the latest collection dubbed "neo-classics." 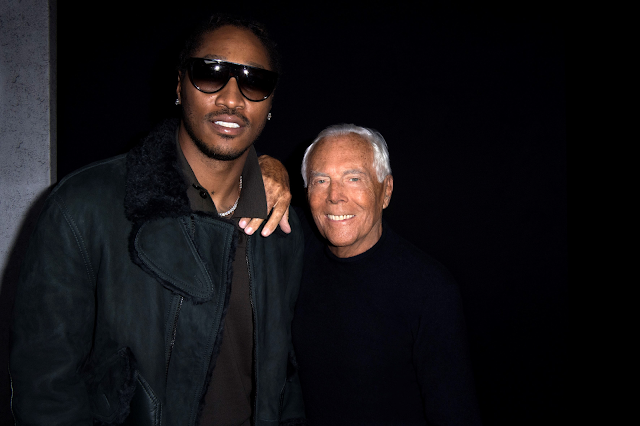 Recently, Future's budding relationship with the Armani house has been drawing attention and splashing all over news headlines - including his most recent collaboration with the brand for their Armani x Bugatti Capsule Collection. Read more here on Vogue. TEXTURE AND SILHOUETTE ARE THE KEY ELEMENTS OF GIORGIO ARMANI’S RESEARCH: AN AUTHORIAL, INNOVATIVE REFLECTION, LED BY THE PRINCIPLE THAT RIGIDITY AND OBSOLETE PROTOCOLS SHOULD BE SWEPT AWAY, GRACEFULLY. IT’S THROUGH THE USE OF EXQUISITELY CRAFTED MATERIALS AND FINISHES THAT THE MASCULINE FIGURE IS HERE REDESIGNED. THIS SEASON, GIORGIO ARMANI IS WORKING ON CLASSICS WITH ECLECTICISM AND A SPIRIT OF SYNTHESIS, EVOLVING CODES TO DEFINE AN IDEA OF ELEGANCE TUNED-IN TO THE PRESENT, BUT RICH WITH HERITAGE. THE BODY, WITH ITS INDIVIDUAL, UNIQUE BEAUTY, IS ENHANCED BY CLOTHES THAT OUTLINE A VIGOROUS FIGURE. THE AMPLE SLEEVE-SCARVES DEFINE THE IMAGE BY WRAPPING THE ARMS AND CROSSING OVER THE CHEST. THE FACE IS ILLUMINATED BY RECURRENT WHITE SHIRTS AND FRAMED BY SMALL, NEAT HATS. TEXTURES ARE NATURAL, WARM AND LUXURIOUS; VOLUPTUOUS SHEARLINGS ADD AN UNEXPECTED, VIBRANT NOTE. THE PALETTE OFFERS A COMBINATION OF MASCULINE COLOURS AND TYPICAL ARMANI HUES, HIGHLIGHTED BY TOUCHES OF ORANGE, DUSTY LIGHT BLUE, BURGUNDY AND GREEN, ALTERNATED WITH CLASSIC BLUE.